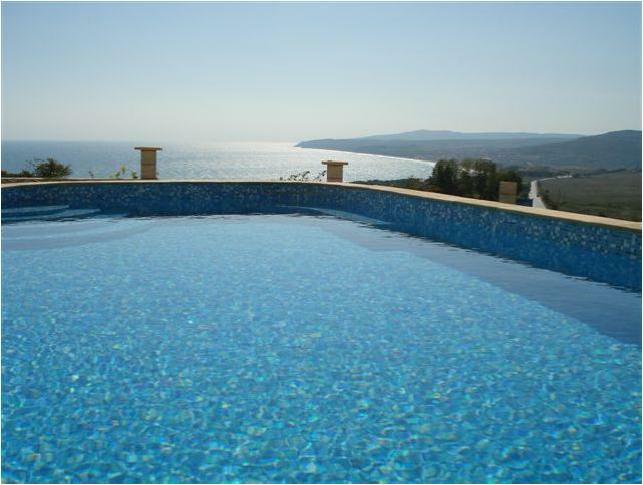 This rental villa is in a particularly attractive village – very close to Varna. What makes Kalimantsi attractive is its easy and quick access from/ to Varna city and Varna airport, beautiful panoramic views towards Varna and the lake, and the outlook of the village itself is very well-developed, with many nice new houses in traditional architecture and good neighbors. Kalimantsi is just 15 kilometers northwest of Varna city and about 10 kilometers away from Varna airport. Within the village itself are many food shops, a small family run hotel, a restaurant, and a cafeteria. The restaurant is very well known to almost everyone the black sea coast, and the experience of having chickens roaming free around your feet whilst you have your meal is one not to be missed! This holiday villa is a cozy one bedroom with it own private pool. The one bedroom has a double bed, and there is also a two-person sofa bed in the living area. There is a fully equipped kitchen, dining area, TV and a bathroom with shower. Both the living room and bedroom open onto the garden. This villa is perfect for small families or couples wanting to get away from it all. The village of Kalimantsi is a perfect place for relaxation and offers a good chance to escape from the noise of the bigger towns. Situated just a short distance from Varna city it is a becoming a very popular residential suburb, which is already inhabited by several English families. What you may not know - During the last decades, 10 new localities were found in the area by D. Kovachev. Of special importance where six species of Turolian which were recently discovered, including several parts of skulls, mandibles and toothrows; among them, there are some specimens of darker color, which are being carefully studied. Do remember with all Pride Rentals Properties, we offer all our rental villas and rental apartments, free advance bookings, Airport transfers, Guest registration, local information brochure and 24 hour emergency assistance.